Immigration, health care, jobs. The extraordinary US midterm election has been a tug of war over key issues, but none has had a more dramatic impact on voters than Donald Trump, the man who isn't even on the ballot. The Republican president is the omnipresent figure as Americans render their verdict Tuesday on the past 21 months of Trumpism. Democrats hope voter dissatisfaction with the contentious commander in chief will lead to a blue wave that flips control of the US House out of Republican hands. Trump's minions are counting on enthusiasm about core issues to trigger strong conservative voter turnout that preserves their majorities in Congress. Here are the key factors in the battle for political control in Washington and across the country. He says it himself: Even though Trump is not on the ballot, he is at the heart of the 2018 vote. The election near the halfway mark of a president's first term is traditionally a referendum on the White House occupant. But the billionaire businessman's explosive and iconoclastic personality has taken the trend to a new level. "A vote for Marsha is really a vote for me and everything that we stand for," he said at an October event for Tennessee's Republican Senate nominee Marsha Blackburn. Trump's scorched earth campaign stops have whipped up conservative fears about a migrant caravan "invasion," waves of crime and a slide towards socialism should Democrats take congressional control. Many Democrats are counting on anti-Trump fervor to drive their base to the polls, but some advocate ignoring the politics of personal destruction and zeroing in on policy debates. Trump is "deploying demagoguery to distract and divide us," and wielding "fear" to shift focus away from issues that Americans truly care about, warned Senate Democrat Patrick Leahy. The campaign's final weeks were marred by the worst anti-Semitic attack in modern US history, which left 11 dead in a Pittsburgh synagogue. Days earlier, a frantic manhunt led to the arrest of a fanatical Trump supporter on charges of mailing pipe bombs to prominent Trump opponents, including former president Barack Obama. This spasm of violence fueled a debate about the president's caustic rhetoric, and whether it has played a role in deepening American divisions. Trump condemned the anti-Semitic attack but was more ambiguous about the homemade bomb threat. He quickly hit the road, and in typical Trump fashion attacked his opponents. Following the outbreak of the #MeToo movement denouncing sexual assault, and the massive women's protests against Trump, women voters and candidates will play critical roles in the first major election since Trump took power. And they appear particularly motivated to vote. Female college graduates in well-off suburbs are in the spotlight because many are voicing disgust with Trump's aggressive rhetoric, and their votes could decide tight races in Democrats' favour. Also a record number of women -- 200 Democrats and 60 Republicans -- are candidates for Congress, where they currently hold only about 20 percent of the seats. Sending thousands of troops to the US-Mexico border to counter a migrant "invasion," questioning the validity of birthright citizenship, and spreading stories of scandalous murders by undocumented immigrants: Trump and his Republicans are making immigration a closing argument of the campaign. It may be a logical move. Immigration is a top concern among Republican voters, and driving those issue-focused Trump supporters to the polls is key. Adding to the fear-mongering are Republican-led conspiracy theories about Jewish billionaire philanthropist George Soros helping finance the caravan of Central American migrants. It is an arresting theme in a country that does not have a universal health coverage system. The reforms signed into law by Democratic president Barack Obama have helped millions of Americans gain insurance. Despite their big 2016 campaign pledge, Trump and Republicans have so far failed to outright repeal Obamacare, although they have unravelled it little by little. Recognizing that the concern about pre-existing conditions has galvanized voters regardless of party, Republicans have seized on it in the campaign's closing month, insisting that their plans would enshrine such protections. "It's a lie," Obama declared on Friday. Between Trump's "trade war," his renegotiation of international treaties, robust US growth and full employment, the economy is at the heart of this election. In mining territory and industrial zones, Trump's protectionist policies are welcome. But farmers themselves have suffered from retaliatory measures imposed by America's trading partners. 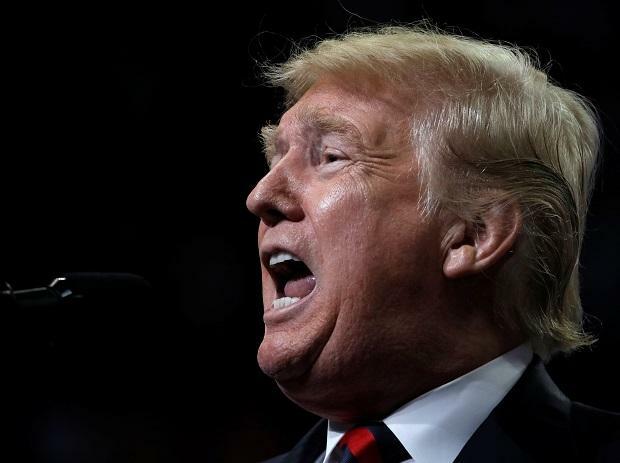 Even with the US economy largely humming along, and Republican candidates desperate for Trump to highlight the gains, the president himself often prefers to rile up a crowd over immigration. "Sometimes it's not as exciting to talk about the economy, right?" he told voters Friday in West Virginia.